When is it an appropriate time to start preparing for pregnancy? WHY does PRE-pregnancy nutrition matter? HALF of pregnancies are unplanned. It is important to maintain proper nutrition during your childbearing years due to the fact that you may unexpectedly become pregnant at any time. Growing embryos are most vulnerable during weeks 5-10 weeks of pregnancy, often before women know they are pregnant. This is when all of baby’s major organs begin to form and when adequate nutrition is most important! If you are planning a pregnancy, proper nutrition increases your chances of actually getting pregnant. Starting pregnancy at a healthy weight means fewer complications for the mom and baby during pregnancy and delivery. So, what are the recommendations? According to the USDA’s 2015-2020 Dietary Guidelines, all women capable of becoming pregnant should consume 400 mcg of synthetic folic acid (not naturally occurring) from supplements or fortified foods. According to Dr. Greger from nutritionfacts.org, women who are pregnant, lactating, or even PLANNING a pregnancy should consume 150 mcg potassium iodide per day. Iodine is important for fetal brain development. Dr. Greger also points out a good takeaway about fish consumption. 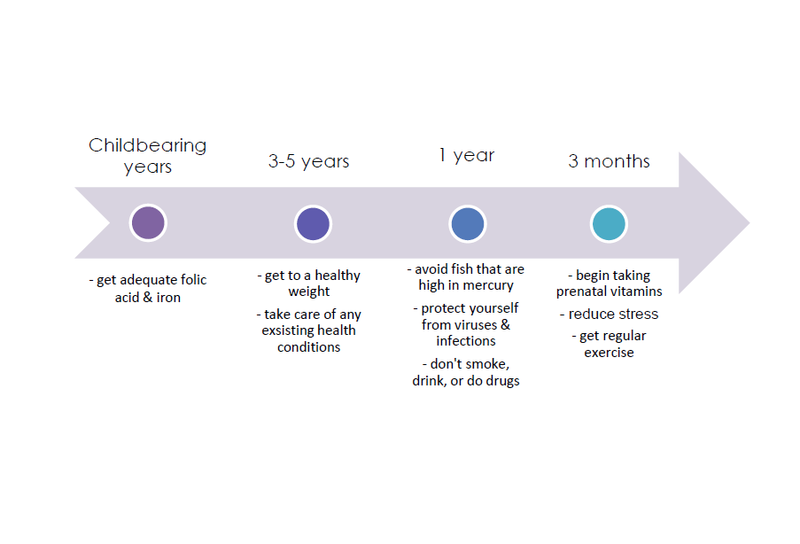 Mercury from fish stays in our bodies for a decent amount of time, so it may be wise to avoid fish high in mercury for a year prior to conceiving. Many women in childbearing years are often deficient in IRON and CHOLINE, as well. It is important to enter pregnancy without any nutrient deficiencies. University of North Carolina, Chapel Hill researchers found that taking at least a multivitamin once trying to conceive reduced preterm births by about one half in a group of 2,000 women. What does the timeline to pregnancy look like? How do I make sure I am eating a healthy diet prior to becoming pregnant? It is best to meet with a physician or registered dietitian nutritionist who can ensure you are making the right decisions leading into pregnancy. A preconception checkup is important so anything that may affect your pregnancy can be addressed immediately. Conditions such as depression, diabetes, high blood pressure, obesity, being underweight, infections, and general poor nutrition can lead to adverse birth outcomes. If you have previously had a complicated/high-risk pregnancy, preconception care may be even more important for you. If you are planning a pregnancy or are already pregnant and need more guidance, please review my prenatal packages and get in contact with me to set up your free discovery call. Let’s get you ready and confident in your ability to grow a baby!